A Chip on Your Pet’s Shoulder? 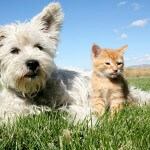 Most clients know that NSVH offers microchipping for all pets. I am a huge advocate for microchips. Just last week, I had clients bring in a young, male stray cat who wandered into their yard. They intended to adopt the little guy, assuming he wasn’t owned by anyone. As is standard protocol for all lost or stray animals brought to us, we scanned the stray for a microchip, and sure enough he had a chip! I called the microchip company and provided his chip number. Unfortunately, the microchip had not been registered by the kitty’s owner, so I could not immediately obtain the owner’s contact information. The microchip company, however, was able to provide me with the name and phone number of the veterinarian who implanted the chip; when I called the veterinary hospital responsible for chipping the cat, they were able to look up the microchip number in their computer system. The owner’s phone number was given to me, and I was able to call and reunite a very worried gentleman with his recently lost cat. What a great reunion story! So, how do microchips work? 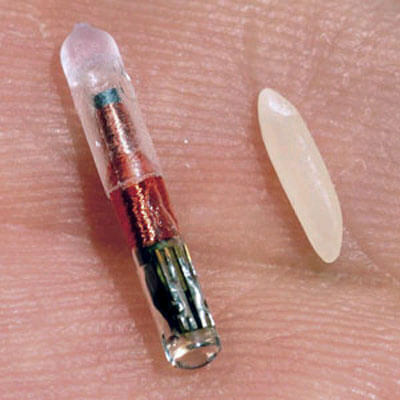 The microchips we use are about the size of a grain of rice. With a large needle, the chip is implanted in the subcutaneous tissue (the tissue directly under the skin), between the shoulder blades. This can be done safely in an awake patient, although we frequently implant microchips in our patients when they are anesthetized for spay or neuter surgery (it’s a big needle!). All veterinary hospitals, shelters and pet rescues now have universal microchip scanners, which can read the frequency of all microchips regardless of brand. It is a standard of care to scan any lost pet brought to an animal hospital or shelter. It is important to understand that microchips do not emit a GPS signal; they cannot be used to track the location of a pet. I would imagine someday that veterinary microchips will emit a trackable signal, but for now they do not have this capability. The advantage of microchips cannot be overstated. They provide permanent, lifelong identification for your pet. Collars and identification tags can easily fall off if your pet is lost, but a microchip is forever! 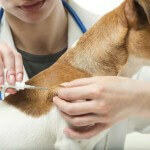 There is a one-time registration and implantation fee for the microchip, and then Fido has lifelong protection. 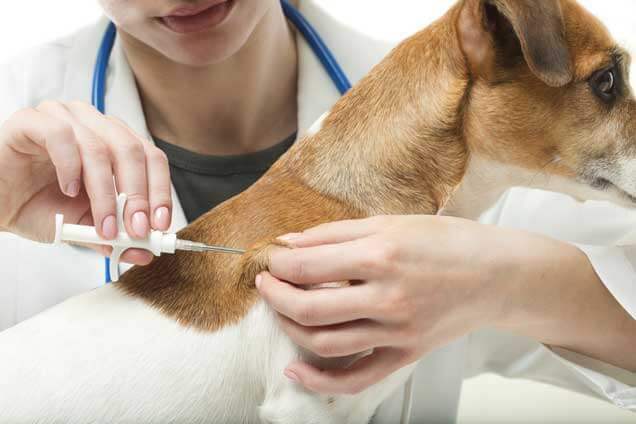 A variety of companies manufacture veterinary microchips. At Malvern Veterinary Hospital, we use HomeAgain chips; HomeAgain was one of the original pioneers for pet microchips and we have found their efficacy and customer service to be outstanding. Once implanted, it is essential that Fluffy’s microchip be registered to you! Otherwise the microchip is “blank” and often cannot be used to track down an owner. Registering the chip is a simple task, just requiring a few moments of time online where you submit your emergency contact phone numbers, address, and pertinent information about your pet. We scan so many blank microchips, it’s disheartening! 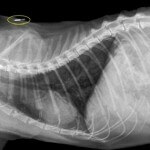 Once implanted, microchips cannot be seen or felt under the skin, but they are visible on radiographs, as shown here. 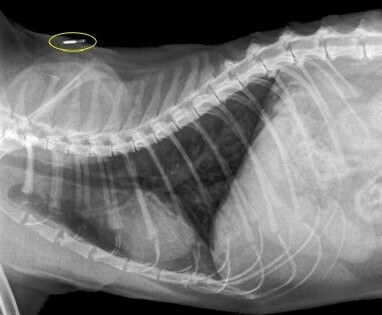 This radiograph on the left shows a microchip in a cat; the chip, visible above the scapula (shoulder blade) is circled in yellow. If Fido and Fluffy are already chipped, this is an important reminder to call the microchip company or verify your registration information online. If your pet isn’t chipped yet, I hope I have convinced you of the value of this amazing technology! In the past year, we have been able to reunite approximately ten pets with their owners, which is positively amazing. 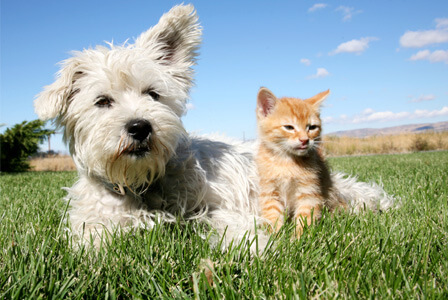 Call us to schedule your pet’s microchipping appointment today. Every Season is Pumpkin Season!